It has been a hectic 2 weeks as WHOAS and our volunteers have been working very hard to ensure the comfort of all our new arrivals. Despite this, inspiration to carry on can come from some remarkable little individuals. Such is the case with a young little lady, Emily, who is 7 years old. 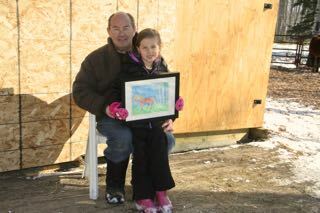 She and her family visited our facility today to donate a picture she had painted of a wild horse. After hearing about what we were doing for the wild horses, Emily was determined to do what she could to help. Her idea was to paint a picture and donate to WHOAS so that could raise funds to help us in our work. Above is the framed picture. For as long as her Mom and Dad can remember, Emily has loved horses. 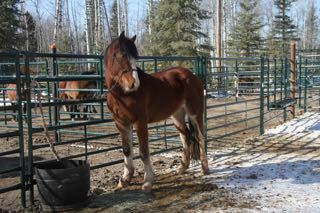 We took this opportunity to show her and her family all the horses that we have in our care. 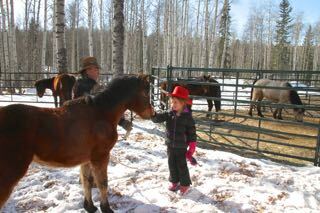 Here she was able to meet “Missy,” one of our first little fillies we took in. Her enthusiasm and excitement was evident to everyone and the love of the horses was in her eyes. So determined was she to help, she, her sister and little brother also pooled their pennies together to take out a family membership with WHOAS. Then having just a little bit left, donated that too. She and her family’s actions give such a positive and uplifting feeling to all of us who have been working so hard for the horses. We thank them sincerely. Emily, you are a real inspiration to us all !! Kudos to you, your sister and your brother for the donation, you young people are so wonderful. Hopefully Bob will soon post a larger picture of your beautiful painting for us to see.